Beth joined the Army in 1993 after graduating from the United States Military Academy. While at West Point, she played Army Women’s Lacrosse for four years, serving as the Army team captain her senior year. 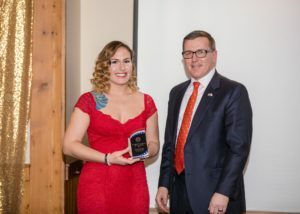 2018 Student Veteran of the Year winner Katy Quartaro with Executive Director of Veteran and Military Affairs Ron Novack. Syracuse University’s Office of Veteran and Military Affairs (OVMA) takes pride in student-veteran involvement on campus, in the community, and at various events. The value student veterans bring to campus through their many contributions are part of what makes Syracuse University ‘the best place for veterans™.’ The OVMA recognizes a single student veteran each year for their significant contributions to the veteran community both on and off campus. This year, the OVMA “Student Veteran of the Year Award” will be presented to the most deserving candidate during the Student Veteran Organization (SVO) Awards Banquet on March 30th, 2019. Staff members from Syracuse University’s Office of Veteran and Military Affairs (OVMA) and Institute for Veterans and Military Families (IVMF) recently traveled to Las Vegas to share expertise around serving military-connected students during the annual National Association of Student Personnel Administrators (NASPA) symposium. On Tuesday, February 19th, the Intra-University Transfer Fair (IUT) will be held in the atrium of Schine Student Center from 11:00 a.m. to 4:00 p.m. Students thinking about transferring to another school or college within the University are encouraged to attend.